Howard Franklin Fockler, 93, husband of Gladys Lee (Smith) Fockler of Staunton, passed away Wednesday, October 17, 2018 in Kings Daughters Community Health and Rehabilitation Center. Mr. Fockler was born on October 3, 1925 in Verona, Virginia, son of the late Tazzy Parkins and Myrtle Laura (Riddle) Fockler. 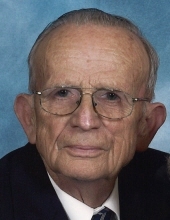 Howard was a faithful member of the Pleasant View Evangelical Lutheran Church, a proud veteran of the United States Army, and was retired from Reid’s / Shop ‘n Save Grocery Stores. He enjoyed visiting with his church friends, was an avid Statler Brothers and Richard Petty fan and he together with his wife, enjoyed decorating their yard for all holiday occasions for those who passed by to enjoy. In addition to his parents, Mr. Fockler was preceded in death by a sister, Bernice May Fockler. Mr. Fockler was the last surviving member of his immediate family. Surviving in addition to his wife of fifty-eight years, is a brother-in-law, James Painter of Staunton; and a number of nieces and nephews. A Graveside service will be conducted 11:00 a.m. Saturday, October 20, 2018 in Oaklawn Memory Gardens by Pastor Derek Boggs and Mr. Jim Sheets. The family will receive friends following the service. It is suggested those desiring make memorial contributions to the Pleasant View Evangelical Lutheran Church, 2733 Spring Hill Road, Staunton, Virginia 24401. To send flowers or a remembrance gift to the family of Howard Franklin Fockler, please visit our Tribute Store. The family will receive friends following the service in the mausoleum. "Email Address" would like to share the life celebration of Howard Franklin Fockler. Click on the "link" to go to share a favorite memory or leave a condolence message for the family.